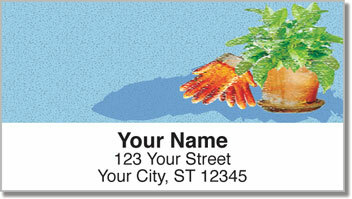 These original return address labels are a great way for green thumbs to prepare their outgoing mail! Simple, yet artistic illustrations of a gardener's essential tools create an attractive design that reflects your taste for natural things. So grab those dirty gloves and muddy boots then fill up your trusty watering can, because there are thirsty plants and flowers waiting for you! 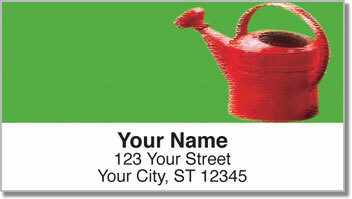 Gardening Address Labels from CheckAdvantage let you quickly take care of the mundane chore of filling out envelopes so you can spend more time on the chores you actually enjoy! 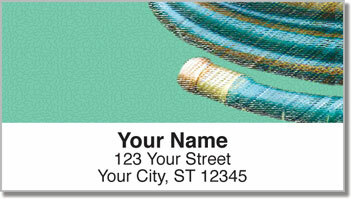 Peel and place them on letters and packages or anything you want to mark with your name and address. 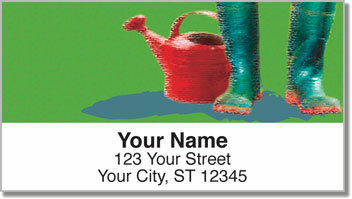 Order you very own Gardening Address Labels today! This exclusive selection is also available in a set of matching personal checks.